What Will Congress Cut to 'Support Our Troops'? The Senate fight over veterans benefits is about to begin in earnest, and it's about to get ugly. 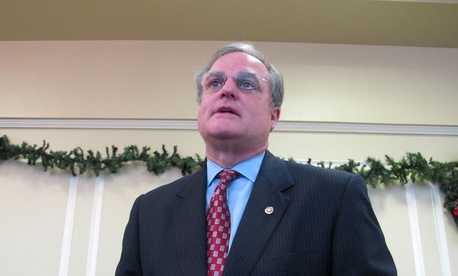 The Senate on Monday will take an initial procedural vote on legislation from Democrat Mark Pryor of Arkansas that would restore $6 billion in funding to working-age military retirees. The benefits were cut as part of December's bipartisan budget deal, but the reductions sparked a massive political backlash, leaving lawmakers rushing to reverse them. But while top Democrats are hoping to move Pryor's measure, they're assuming it will fail to get the 60 votes needed to clear cloture, according to a senior party aide. His bill measure lacks a way to offset the benefits cost, and for Senate Republicans, that's a fatal flaw. Democrats, however, have an alternative option for when Pryor's proposal falls: a separate, broader bill from Bernie Sanders of Vermont that would not only reverse the $6 billion in benefits but also expand access to other veterans benefits, such as health care and education. Sanders's bill would cost $24 billion; the measure would offset $20 billion of that by taking money from the Overseas Contingency Operations Fund, a pool of money for the Afghan and Iraq wars that is exempt from Congress's self-imposed budget-cap laws. The other $4 billion, Sanders said, would come from other funds under the committee's jurisdiction. But that mechanism won't pass muster with Republicans, either, who argue that it's an end-run around budget rules and does not represent real-life fiscal discipline. And so Sanders's bill faces long odds in the Senate and has virtually zero chance of passing the House. "The pay-for has turned out to be more of a sticking point than I thought," said Sen. Roger Wicker, R-Miss. "Much as I would like to solve the COLA problem, I'm not willing to add to the national debt." So why are Democrats teeing up a string of bills they know won't pass? Obviously, they—like Republicans—want to undo the pension cuts, and these proposals represent their preferred method for doing it. But Democrats are also interested in forcing the GOP to continually vote down veterans' funding, seeking to harness the maelstrom raised by the cuts and steer it toward their rivals. Republicans, for their part, argue they're the ones who are sincere about repealing the cuts—they just won't sacrifice budget discipline to do it. "As I'm sure you know, Democrats are a little late to this effort. Republicans have multiple bills that would fix the COLA problem without adding to the deficit," said an aide to Minority Leader Mitch McConnell, R-Ky.
Sen. Kelly Ayotte wants to tie reversing the cuts to stopping what she views as tax fraud. The New Hampshire Republican's plan aims to bring in $20 billion by making it harder for some—namely, undocumented immigrants—to claim a child tax credit. Sen. Richard Burr is pushing a broader veterans benefits package similar to Sanders's, but the North Carolina Republican's measure would likely use Ayotte's funding mechanism. Democrats, meanwhile, have their own budget-neutral alternatives—albeit ones that Republicans will likely find unpalatable. Sen. Jeanne Shaheen, D-N.H., and Rep. Dan Maffei, D-N.Y., have introduced legislation in their respective chambers to swap the roughly $6 billion in cuts with closing a tax loophole for offshore corporations. In the middle is Sen. John McCain, R-Ariz., who is still eyeing the $550 billion National Defense Authorization Act as the most likely vehicle. Congress always manages to pass the yearly spending vehicle, which McCain sees as large enough to provide ample opportunities to offset the cost.